Cold, low 40s, 50% cloudy with altocumulus, still. Ah, Slow Roll, what pure joy. Easily 200 bikers, all forms of bikes (mine the only folding that I noticed, and no one commented to me), thru the downtown area, whistling, hailing, shouting, boom boxes booming, along the river front (stopping for a group photo, some holding their bikes over their heads), and around the near East Side. 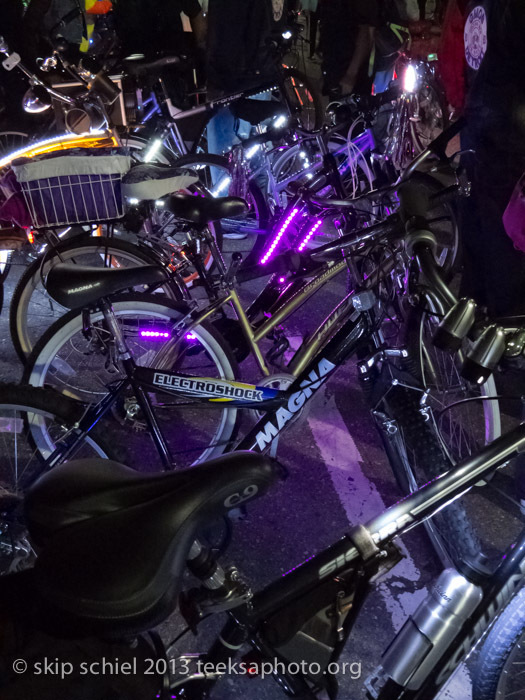 Light waned, bike lights blazed, spokes lit up, bikes glowed in ways I’d never seen before. I only hope my photos show a portion of this magnificent extravaganza. Blacks and whites together, all congenial, or seeming so, mostly young, me perhaps the oldest (altho I felt young and gay), bystanders gawking and laughing and smiling, into the evening and back to where we started, St Andrews (which might be an old hotel, now restaurant). Earlier I’d eaten fish and chips (delicious) at the Greek restaurant where I’m sure I’ve eaten before. I ate outside (the only one outside) in the chill air (so I could guard my bike). In the afternoon, near the river I met the only other folding bike rider I’ve met so far: older, black, somewhat heavy, with helmet and other gear. 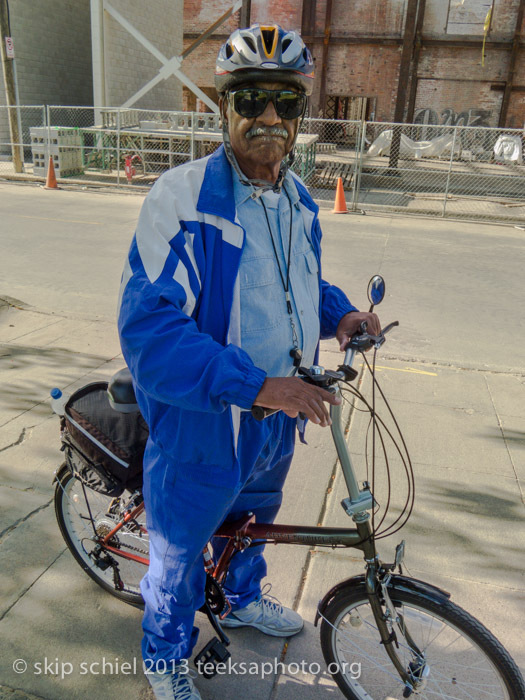 He told me he bikes to increase blood circulation in his legs where he has problems. Bikes alone, would never join Slow Roll, rides an Adventurer bicycle (which I’ve never heard of), guaranteed but with multiple problems that caused him to return the bike for replacements twice. 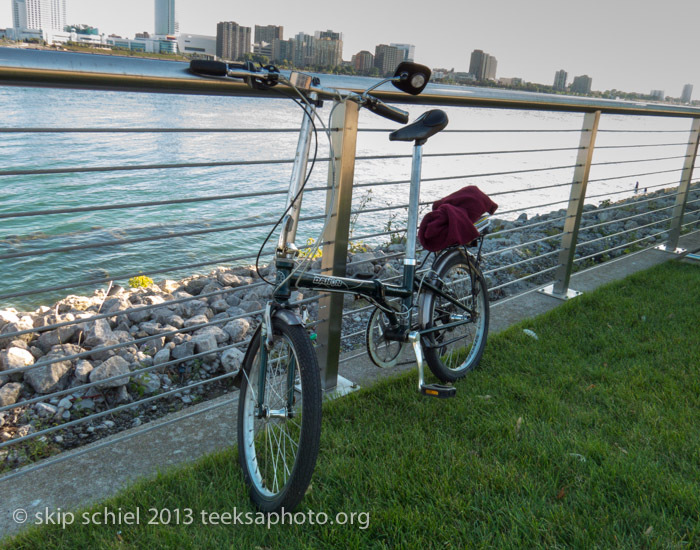 He bikes only on sidewalks, and usually only along the river—and definitely always alone. Beginning my long adventure I noticed a small garden along Grand River Avenue that I’d not seen before. Stopping, I photographed it amid the debris of Grand River. 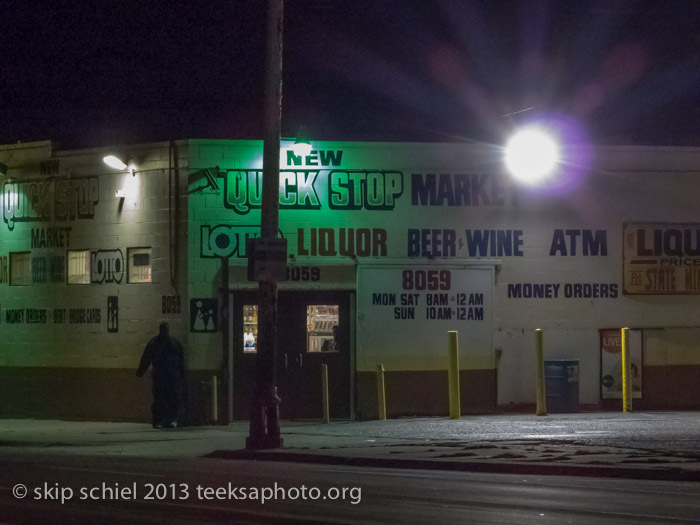 And biking home last night I noticed men entering and leaving liquor stores, their forms dark against bright security lights—for me an ultimate image of desperation, despair, and suffering. This might make a good photo, I thought. So I tried several times, standing as much as possible in shadow to not be noticed. 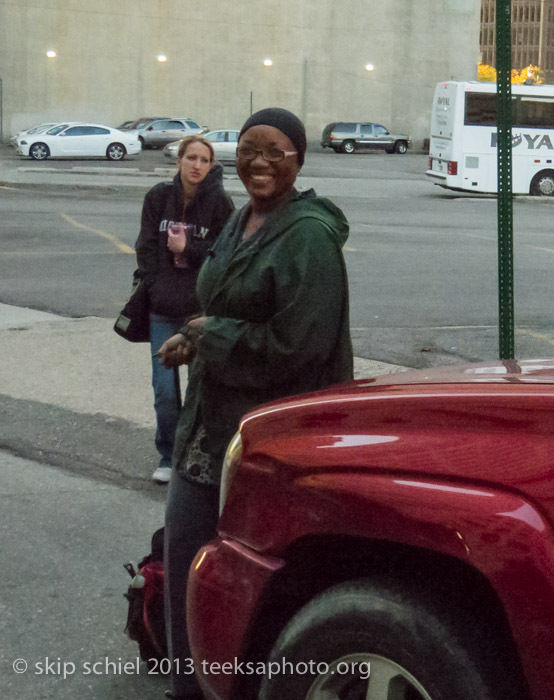 I constantly checked over my shoulder to make sure I was not about to be ambushed in the dark. 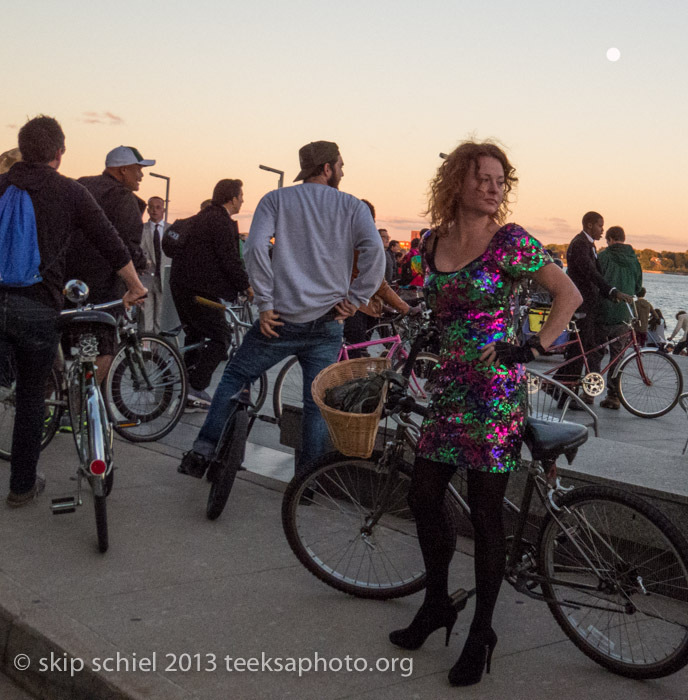 Coda: a few days ago while preparing the photo set about Slow Roll I discovered that the theme of the ride had been Prom Night. 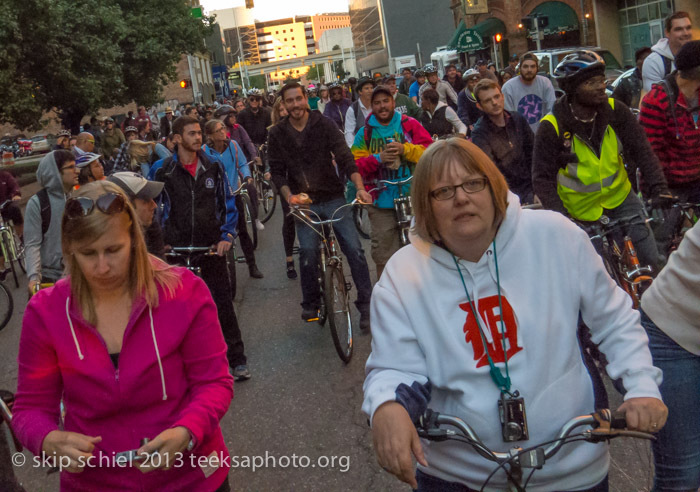 The following week, September 23, the ride theme would be Literacy and the ride would tour to selected literacy training sites in central Detroit. I also learned that Boston (I live in Cambridge, near Boston) this summer initiated a mass ride called Boston Bike Party, on top of a pre-existing and highly controversial ride called Critical Mass. 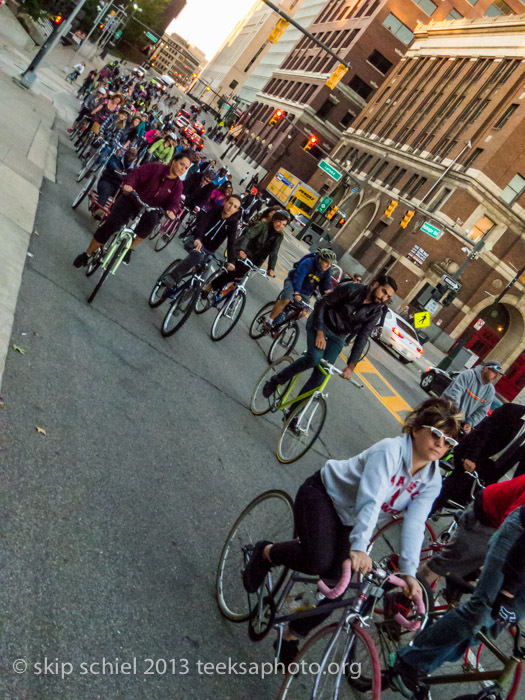 Unlike Slow Roll, allegedly Boston’s Critical Mass often deliberately creates road chaos and alienates motorists. Not so with Slow Roll—disciplined, respectful of motorists and pedestrians, well received by most.